Messy Jess C.: Extra! Extra! Good morning friends and happy leap day! Doesn't an extra day feel a bit more special than other days? It could be because this is a once every four year thing. It could just be that I am excited that I have one day to go in my Winter 30 for 30 and I am ready to change up my wardrobe a bit. It could be because we have reached the half-way point of the week. It could be because one of my best friends got engaged to one of the greatest guys last night! Whatever the reason, today is going to be a good day. I can feel it (with the exception of the buckets of rain we are getting - hence the fuzzy picture taken as close to outside without actually being in the rain today). Sadly, I still have to work this leap day and won't be able to take advantage of "One More Disney Day" when Disneyland and Magic Kingdom will be open for a full 24 hours for the first time ever, but maybe next time... in 2016. Still, I am big into holidays, any holiday, and a sucker for romantic comedies, so to celebrate, I am planning on watching Leap Year this evening. What are you all doing to celebrate the extra day? 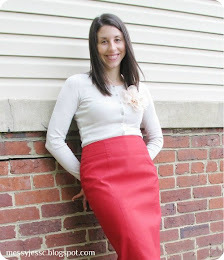 Ooh I love the cranberry paired with the mustard skirt! Can't say I'm doing anything for Leap Day...it's just another Wednesday for me. Enjoy the movie later!